From Artists & Arts, Amsterdam, Croatia, Food, Leisure, Nature, Slovenia to Tourism. Why choose? I love it all! Thank You for the ‘Like’! Yes, I’d like to thank you too! Thanks for liking my post! 🙂 I’ll try to spend some time on your blog. Looks interesting range of subjects! Bit like me. Churchyard Chick thanks you for “liking” her post. I know Paški Sir, love it and yes I totally love chillies with anything. If you’re not used to spicy food the spicyness will rule, but for me the chillie would accompany the flavour of the cheese beautifully… In The Netherlands spicy cheese is to be found in about any cheese shop but I prefer the quality of Croatian cheese above the Dutch. Just wanted to say that I really love European cheese! I live in England, but I’m from Sweden… Anyway, I went to the local butcher’s and found a cheddar cheese with horseradish and mustard in it. Looovely!! I’ve got some news for you, please stay “tuned”, I just received cheese from Mr Simon Kerr of Sirana Gligora (http://www.sirena.hr/) from the island of Pag, Croatia, and I am going to do a funky but tasty experiment and will write about it on my blog! Mr Simon Kerr & I have regularly been in touch since his first message up here, with the result that I just received a box of cheeses from Sirana Gligora (http://www.sirena.hr/) from the island of Pag, Croatia! Please stay “tuned”, for my funky but tasty cheesy experiment I will write about on my blog! Thanks for the like! I LOVE your squid pic! That is the rave name of my daughter (Squiditha)! Thank you! 🙂 I googled her, she makes beautiful drawings! Did she draw any squids? I’m looking for someone to draw me one! Actually btw… it’s an octopus.. a squid is a bit different but also beautiful. And they both belong to my supertastiest foods. Hi. thanks for liking my ocean sunfish post! And a good 2012 for you! Thanks for your “like”. My blog is more about travel, and food. Hope you follow my blog, too 😀 have a nice day! Thanks for the “Like” and stopping by! Thanks for visiting my blog and liking it. It’s lovely to get visitors. Are you based in Amsterdam? I’ve been there a couple of times and liked it very much. Yes, I’m in Ams! I also get excited from visitors, so thank you too for passing by! hey there! hows it going? thanks for dropping by and liking the posts! I’ll have to cycle through the rain after work but life is good! You have a very diverse blog too, like your style. thanks for the like! you have some diverse interests! I do. And i spent a lot of time thinking what I should not write about, but then I decided I’m writing for my own pleasure so I’m alloud to write about anything I like! I now understand it is! So thx for visiting my blog too! You’re welcome! And I understand that! I feel much better when I notice that people I don’t actually know in person visit my blog. Thank you for liking my post. I am always surprised when someone else reads it. It is mainly a way for me to cope with what is happening in my life. You’re welcome. Sometimes it’s easier to share with people that don’t know you. I wish you a lot of strength. thank you for checking on our blog and your interest in our straw bale project. I was curious to know how you’re managing to get so many visits and comments, is it just by visiting other blogs and leaving comments yourself? That’s something I’ve not been very good at – I am going to try and do it more often. If anyone else on here would like to visit my blog, I will visit yours back. I write about all kinds of topics in a humorous, anecdotal style – with particular focus on word and communications, as I am a journalist. That’s indeed about the only way. What helps too is to use the right tags and hope that WordPress posts your post on their homepage. Be smart when you use tags. I once followed a Google course on the use of tags. Didn’t think I was going to use it but it’s useful! Also because I like so many different subjects and thus use so many different tags, I am to be found in Google (WordPress automatically fixes that for you). I also use my blog name when i leave a reply on a website or enter a competition or on Youtube, so when people see DLCS Management, sometimes they wonder what it stands for, use a search enginge and end up on my blog. Your blog is clear and pretty, I immediately voted on your poll. interesting – I’ve been starting to realise the importance of tags. I now make sure every post is tagged, which I didn’t always bother doing. Also, I have started using the word Humor (American spelling) as well as Humour (British spelling) – sounds obvious but it hadn’t occurred to me. I think that is helping, as I’m seeing a slow but steady increase in visitors. Thanks for voting on my poll – I was pleased when I worked out how to put one on the blog. Oh yeah, one more tip; There’s a WordPress forum. I don’t hang out there regularly but when I feel like it every once in a while I participate in for example a wordgame. There are many other participants who then check out your blog. One of the games is for example; rate the blogger above you. Thank you for liking my post! Food and gypsy music… love it. I will be coming back! Glad you “liked” my post! We are truly wired for music. Thanks for the like! Cheers! Hi, thanks you for liking my post,cheers!! Thx for liking my post on the balkan. Nice Octopus, did you take the pic? Thanks for dropping by Male/Female! Thanks for having a look at my new blog! Great to have some likes so early on! Thanks for taking a look and for the ‘like’! Thanks for the like. Neat blog! Thanks for ‘liking’ my recipe! You’re blog is a good read!! Thanks for the like on my blog! That’s one scary squid I wouldn’t want to meet on a dark night! Thanks for your second ‘like’ on our blog. Hopefully you will like our future posts to. Many thanks for the like!!! Thank you for liking my post!! I will update soon with new info and pictures from Bojum – my blog is going to be a daily updated page!! Hope to have you visiting again!! Mike D.
Thanks for stopping by lastmomstanding.com and liking my post! Thanks for visiting my bean bake blog. I’ve been enjoying my ramble through yours…what an eclectic mix of posts! Congratulations on a really interesting blog. Thank you for stopping by my blog! Nice meeting you, cool stuff at dlcsmanagement ! Hi There-Thank you for the like on my Happiest Baby on the Block post at mommysorganics.com. I’m always up for learning more about other cultures and like your mix of subjects. Thank you for liking my post about Chico Baldini! Thanks for the ‘like’, dude! Great ingredients, love the spices and cheeses so unusual! Thanks for the critiques on the cheeses, eastern europe very exotic for americans and mouthwatering! Thank you for liking my blog! LOL!! Due to your Blog’s name, I expected like a Corporte Blog! I am Most Pleasantly Suprised! Thank you, THANK YOU! That’s a bit the intention. 😉 Plus I didn’t come up with the perfect name yet. Actually I did; DLCS, unfortunately I was not the first to chose that one. Your work will keep us coming back! Thanks for liking our blog, we just started!!! Cool! Yes, passport says Dutch, the heart says Amsterdammer. Similiar, but the heart says Rotterdammer:P However studied and worked in Amsterdam!!! Thanks for stopping by. Come back again sometime! thanks for liking my post!.. 🙂 you got a bunch of beautiful photos!!.. Thank you for the like on my blog…. appreciate it. Thanks for the click. Keep on wordpressing. Hvala lepa za “like”. Zivijo in z Bogom! Congrads, you got the first like on my very first blog ever! Thanks! Hi and Thanks for visiting my blog and liking “Amsterdam…My View”. I am looking forward to returning and sharing more stories. Hello…thank you for the like. Ljubitelj sam dobre hrane i putovanja proucit cu ovo. Hvala. I ja sam… & istina! Thank you for liking the post at our blog. hanks for the like. Like the look of your blog, a lot of your tags match mine:) really miss Amsterdam too, so look forward to a seeing posts about it. Thanks for your “like” at http://lessfruit.wordpress.com . Bent uw uit Nederland? You’re welcome! Jazeker, althans op mijn paspoort staat van wel. Thank you for liking our blog post. We don’t know where Amsterdam is but Mom says she’s been there and it’s far away from us so we won’t be walking over there for a visit. It’s nice we can meet this way. Hi! Amsterdam is suuuuperfar. Just stay safely around your house, you have such a beautiful garden! My Mala (https://dlcsmanagement.wordpress.com/2012/04/11/my-1st-buzzbox/) cannot play outside unfortunately, we live in a tiny apartment next to a busy road…but if I wouldn’t have taken her in she would not have survived. We’re happy that Mala found a new loving home and we know she’s happy. We love meeting humans and fur people from all over the place. Please tell Mala hi for us. Those hot peppers have reminded me I need to plant mine very soon. Thanks for the thumb’s up on Fried Neck Bones…and Some Home Fries. And did you plant them? I’ve never tried, time to start too! Thanks for liking my recent post Silence. Thank you for checking out my recent post, the first of a number, on Amsterdam. Thank you for the like on my post about Spiked Chicken! Thanks for the like on my recent post. Thank you for the like on my post on Spring in Amsterdam. Let me know when you do so, so I can give you some up-to-date tips! 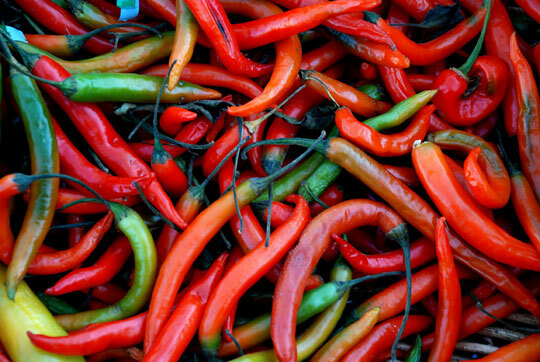 Not strange you craved chillies, I’ve read they contain endorphines, so just give in to the cravings! ThX for your compliment! Like your blog too. And got this great idea from your post in which you mention you read about the place you’re at when you travel. Seriously never crossed my mind 😉 Keep tagging! I’ll post about the award soon. Got some work to catch up after London (Yes I’m back in Ams). Many thanks for dropping by my little corner of the WordPress universe! You’re the second person I know to use a squid as a logo. My son-in-law is the first – he called his “Deadsquid.” At the time I thought it was a little weird… now, just awesome! Interesting! Wonder how he got to “Deadsquid”. Love your nickname by the way! Kind of you to stop by my blog today! Thanks for liking the recipe for apricot pork tenderloin. Glad to make your e-acquaintance! “e-acquaintance”, never heard that before, put a smile on my face. It sounds better than “NIce to meet you”….well, likewise! Thanks for visiting my blog-:)! Thanks for visiting and ‘liking’ my blog. I’ll try to keep posting things to interest you, and good luck with your blog. Like Snowapple too btw – anything with a fiddle and mandolin, not to mention three lovely Dutch girls! Thank you for visiting my blog and liking one of my stories. That means a lot to me -:)! Congratulations! We nominated you for the Very Inspiring Blogger Award (http://twocatsviews.wordpress.com/2012/06/22/award/). Thanks for the like! Now I need to chug some antacid after looking a little too long at that photo of those gorgeous chili peppers! Thanks for the Like Dude! Glad you liked StretLaw – if you want to guest blog, let me know! I Like your blog and the articles are very interesting, but I’m a complete lay”man” when it comes to the law; I can only write from my personal view or experience or observation… I don’t know if you have a demand for that? always! Comments from a lay perspective always welcome, social justice views as important. Get in touch via the ‘Get in touch’ page! Never thought a napa cabbage recipe would get me a like….haha. I plan to stay in touch! thanks for visiting me in Salem, MA USA… One of my lifelong dreams is to visit Amsterdam. someday I’ll get there! Let me know if you do so, I’ll be pleased to give you tips! I love Ljubljana in December! Kuhano vino, vroce medice in klobase on the streets and then to the bridges to watch the fireworks from the castle… I hope I’ll make it this year! Thanks for the like! This looks nice – I’ll be sure to stop by and check out the new stuff! Hi and thank you for liking my post on friends in Granada, Nicaragua. I just glanced at your about page and see you love cheese -me too! Will read more soon. Thanks for stopping by my blog – I look forward to reading yours too! Rembrandt and I both thank you! I fell in love with Croatia when I was 5. Slovenia followed when I was 17. Dubrovnik is tricky, prices are touristy, quality of food not everywhere as great. You are going in the right period though, you will no trip over tourists and maybe the prices are more normal. Plus yes Du is an amazingly beautiful place! Enjoy! And let me know how you liked it! Thank you for your like of “Your Country Very Hot.” Best wishes. Thanks for checking out breakfast bread. Love the chile pic!!!! Hi! Thanks for ‘liking” my blog. Thanks for visiting howardgoldenberg.com. How did you know I love chillies?!?! Thanks for the recent “like on my blog with photos of Dubrovnik. Really appreciate that you enjoyed it. Thanks for liking my posts! Good luck! Thanks so much for visiting House of Bedlam! Glad you liked our post! Thanks for the like and visit! Thank you for liking my post about my childhood away from Croatia it was important to me. Thanks for passing by my blog. it is just the beginning. more pictures will come! Hello there, thank you for stopping by at trashbus and liking my post “Oh Joze!” You seem to have a pretty interesting blog here, I’ll check out some of your posts, too! Have a nice day! I like the style of texts, how you pick your words! Thank you for the likes and for stopping by my blog 🙂 . and guess what? I am currently in Slovenia, so watch out for new posts about Slovenia .